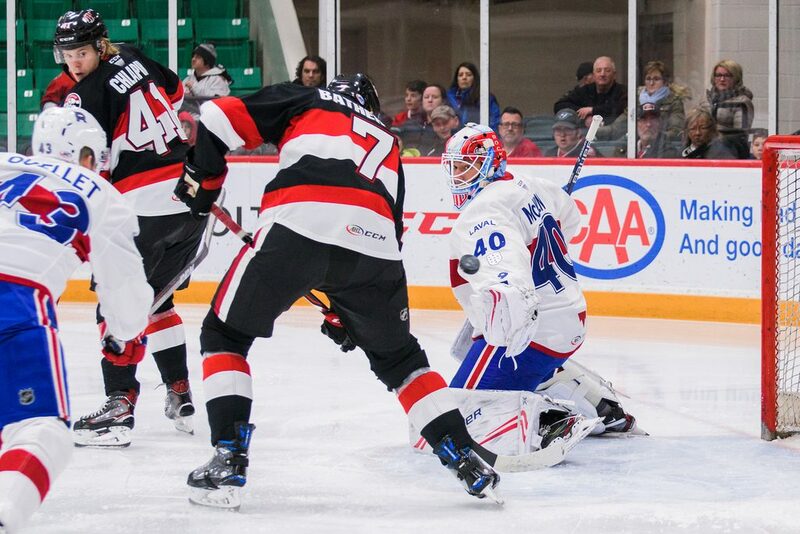 After losing their fifth straight game on Friday night, the Laval Rocket boarded a bus and followed the team who had just beaten them back down the highway to get ready for the second part of their home-and-home series with the Belleville Senators. But a quiet day of pre-game prep on the road was not in store for the Rocket as the Montreal Canadiens made waves before lunchtime as they announced a trade with the Philadelphia Flyers. The Canadiens acquired forward Dale Weise and defenseman Christian Folin in exchange for Laval captain Byron Froese and defenseman David Schlemko. Folin would report to the Habs, while Weise was assigned to the Rocket but not expected to join the team until Sunday or Monday. So without two more of their veteran players, the Rocket found themselves very heavy on rookies as they faced off against the Senators on Saturday night: seven of the twelve forwards in the lineup were in their first pro season. The first period did not go well for Laval as Belleville scored on an early power play. The team then lost Hunter Shinkaruk as he was taken down hard in the corner and headed down the tunnel bleeding profusely from his nose. 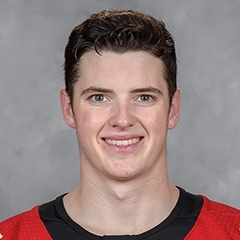 Drake Batherson continued his point streak (eight games) as he tallied another goal for the home team before Michael Pezzetta scored an odd goal in which he batted the puck out of mid-air while engaging in some rough stuff with Darren Archibald. Things didn’t improve much in the second period. Lukas Vejdemo took a high-sticking penalty very early in the frame, which allowed Nick Paul to score another power play goal for Belleville. The Rocket managed to pull back within one goal, however, when Alex Kile took advantage of the puck’s awkward bounce off the end boards and tapped it back door behind Filip Gustavsson. But Batherson made sure the two-goal lead was restored when he completed a beautiful back-and-forth passing play with Logan Brown which Michael McNiven had no chance of stopping, giving Belleville a 4-2 lead. Head coach Joel Bouchard pulled McNiven from the crease for the night and Charlie Lindgren entered the game in relief. After Batherson completed a hat trick just over a minute into the third period, Kile scored his second of the night just 12 seconds later to keep his team within two. The teams exchanged a number of penalties as the period wore on, but it was on a Laval power play late in the period that Filip Chlapik was able to dash the Rocket’s hopes for good. On a shorthanded breakway, Tobias Lindberg looked to have Xavier Ouellet beat so Lindgren came way out of his crease to cut him off. Ouellet lost the puck, and his man, at the same time which allowed Chlapik to bury the puck in an empty net before Lindgren could get back. It was another ugly night for Laval as they dropped their sixth straight game. Adding salt to the wound, most of their division rivals in the standings above them won their games on this night and put more distance between them and the last place Rocket. Laval currently sits 11 points out of a playoff position. Shinkaruk did not return to the game and his status will be updated after further evaluation. The Rocket have no time to rest, as this game kicked off a six-game road trip. 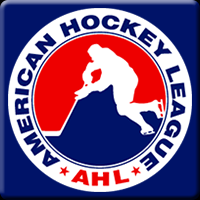 They’ll now travel to Utica where they’ll face another North Division rival on Wednesday night.